There are at least 176 known natural moons orbiting planets in our Solar System. While the mystery of what lies on the dark side of Earth's moon was solved thanks to photographs from space probes, Jupiter, Saturn, and Uranus have moons that raise questions to which we still have no convincing answers. What are those strange lines on Europa? Why do Io's volcanoes seem to be misplaced? What is the origin of that colossal ridge on Iapetus? Let's take a look at five of these mysteries. Titan, the largest of Saturn's 62 moons, is the only natural satellite in our Solar System that is known to have a dense atmosphere - and we don't know why. Typically, small bodies like moons don't have the gravity to "hold onto" an atmosphere, which would escape into space. Titan is 80% more massive than the Earth's Moon, with a diameter 50% larger, making it the second-largest moon in the Solar System after Jupiter's Ganymede. This may help explain how it retains some of its atmosphere, but Mars has only a tenuous atmosphere and is even larger than Titan. The other factor that comes into play is the presence of a magnetic field. The Sun constantly emits a solar wind - a stream of charged particles - that bombards planets and moons, stripping away atmosphere. But planets with magnetic fields are able to deflect most of the incoming solar wind. Earth's magnetosphere is generated from the motion of its liquid outer core around its solid inner core, but Mars, whose core is solid, lacks a protective magnetosphere. While Titan doesn't have a magnetosphere of its own, the moon does spend 95 percent of its time inside Saturn's magnetic field. But even if we could explain why Titan hasn't lost its atmosphere, we don't know how it acquired such a dense atmosphere to begin with - one that is about 7.3 times more massive than Earth's on a per-surface-area basis. 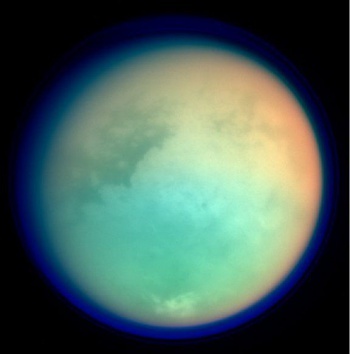 We also don't know why Titan and Earth are the only two bodies in the Solar System with dense atmospheres that consist primarily of nitrogen, weighing in at 98 percent and 78 percent, respectively.